This Business Plan served the information purposes of crowdfunding round December 2017. Updates on the Business Plan will not be disclosed in the public domain. Issue price of Solarus Cooperative UA memberships: € 20. Solarus Cooperative UA will buy shares from Solarus Sunpower BV at €14 per share. More information on the return can be found at the section "return" under "Finance"
The memberships are offered by Symbid Cooperatie UA. The provider is NOT the issuer of the memberships. The issuer of the underlying shares is Solarus Sunpower Holding B.V.
Investors in this issue will join as B-members of Solarus Cooperatie UA, who will in turn use the entire proceeds to acquire new ordinary shares in Solarus Sunpower Holding B.V. Within the business plan and offering documentation, the 'issuer' will be regarded: Solarus Sunpower Holding BV. Solarus developed and manufactures the PowerCollector, a hybrid solar collector that harvests up to 70% of the energy from the sun. On average, PowerCollectors produce 3x more energy from a surface compared to conventional solar panels: 3x more energy, 3x more CO2 reduction, 3x more profits. Last year Solarus closed the largest Symbid equity crowdfunding campaign till date and is nominated for the Dutch Crowdfunding Awards. In 2017 Solarus closed a € 6.7 million investment round. With this fresh capital we were able to further automate our high-tech production facility in Venlo enabling production of our PowerCollector at mass scale. Our team has been strengthened by three experienced sales professionals with whom we defined a clear focus on the hospitality and (food) industry markets. This focus resulted in signed term sheets with the Hilton and other hotel chains in South Africa, a large project in The Netherlands and business partnerships in India, Cyprus and Africa. Currently Solarus is in serious negotiations for an even bigger investment round. Our mission is "Sunpower for the People", but we also want to be a company from the people and enable everyone to become part of our company, journey and future success. Therefore, we believe that this is the right moment to launch this second, and probably last crowdfunding campaign. This is, in the slipstream of professional investors, a unique opportunity for private persons to become shareholder in Solarus as well, join our mission and benefit from our future success. We are asking the crowd to fund an amount of at least € 500.000 with the ambition to exceed this. You are kindly invited to invest in the future! Our PowerCollector™ delivers the highest solar energy yield ever measured: 70%! It generates up to 3x more energy than conventional PV-panels per square meter. Swedish & Dutch robust design: strong patents and unique production technology makes it hard to copy but easy to scale. Solarus is a B-corporation (www.bcorporation.eu) with a mission: fighting energy poverty and climate change. 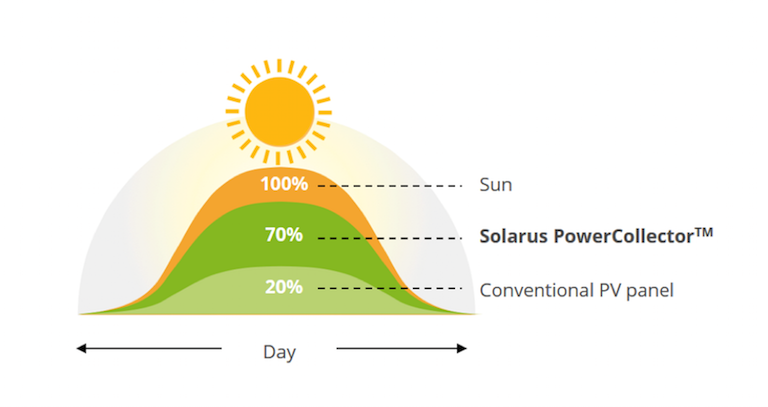 Besides selling the hardware we’re currently gaining experience with an Energy as a Service proposition that Solarus gets compensated for the energy that we deliver and save. Solarus recently celebrated its 10-year anniversary. In these 10 years we’ve been able to bring a scientific idea and concept to a product that can be produced at mass scale. Over the years more than 14 million has been invested in R&D and production facilities. With result: the production time of a PowerCollector decreased from 8 days 5 years ago to 6 minutes now! Based on the experience and the performance of 1.000 PowerCollectors at 40+ installations around the world, we were able to improve our product. In 2016 and 2017 we’ve closed five business partnerships in key markets. 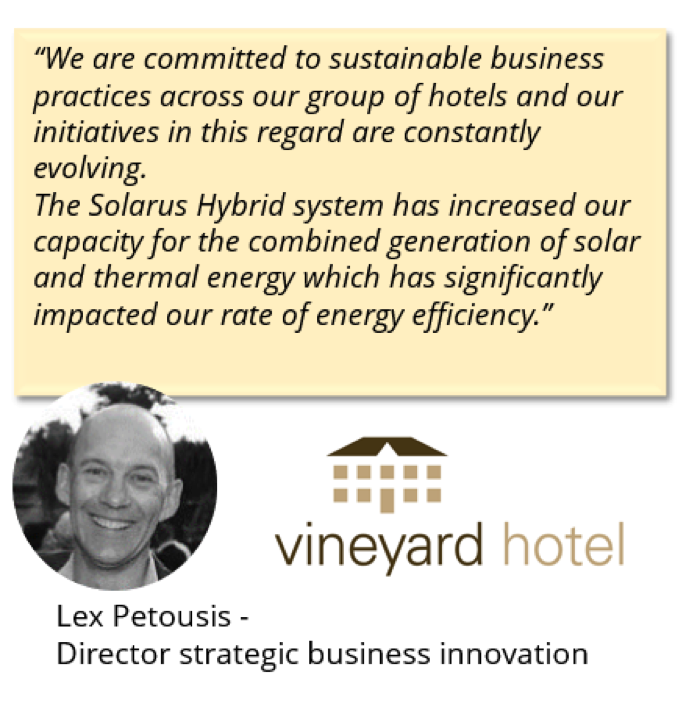 To manage and accelerate our growth, Solarus grew from 5 people in 2014, to 37 employees now. In 2016 we won, out of 124 contestants, the Accenture Innovation Awards for Clean & Affordable Energy and in 2017 the Erasmus Energy Business Award. In 2017 we further optimized our production facility in Venlo, we strengthened our (sales) team and delivered several large projects. Our sales and marketing efforts materialized into a strong sales funnel, multiple signed contracts and 25+ opportunities that we expect to materialize in 2018. This is a total of: 4.2M. We’re close to finalization a 2.6M investment round and we’re in the final discussions to obtain a 4M loan for asset investment. Herewith we can easily meet our needed cashflow. As a B-corporation however, we want to share our future success with a broader group of investors and therefore launch this crowdfunding campaign, in which we anticipate to raise an amount of 500k to 1.5M. In case we do not meet these investment targets we will reduce our investment plans. For the Reduced scenario (800k of the 4.2M), We need to raise at least 800k to run our business in the next 9 months. Investments in product improvement and production scaling will be delayed. In this scenario we’ll keep running our business with our current equipment and team and will keep on searching for additional funding. The proceeds are not sufficient for the rollout of the complete business plan scenario for 2018 and 2019. For this, an amount of € 4,200,000 is required according to the current estimate of the issuing institution. In addition to this issue, an issue is also offered to professional investors. This emission via provider Symbid Cooperatie UA is only successful if the 2 emissions together result in a minimum amount of € 800,000. If this emission has achieved the minimum amount of € 500,000 but NOT at least € 800,000, the emission can only be successfully placed if the emission that is offered to professional investors supplements at least the amount to reach the stated € 800,000. The issue that is additionally offered to professional investors is at the same price per share Solarus Sunpower Holding BV and does not grant any preferential rights to these professional investors other than in this issue. Within the issue to these professional investors, however, no placement costs are charged in the form of a success fee and the option, depending on the specific wishes of the professional investor, to join the board of directors of the issuer. Professional investors will also participate directly in the issuer and not via an Investor Cooperative. In 2017 Solarus finished an investment round of € 6,7 million. This fresh capital inflow enabled the company to expand business internationally. Amongst the investors is the ForestEffect Fund, a leading impact fund that is liaised to the Dutch Good Growth Fund of the Dutch Government. Next to ForestEffect Fund also the industry based investor NASACA Smart Energy Investment, signed in. 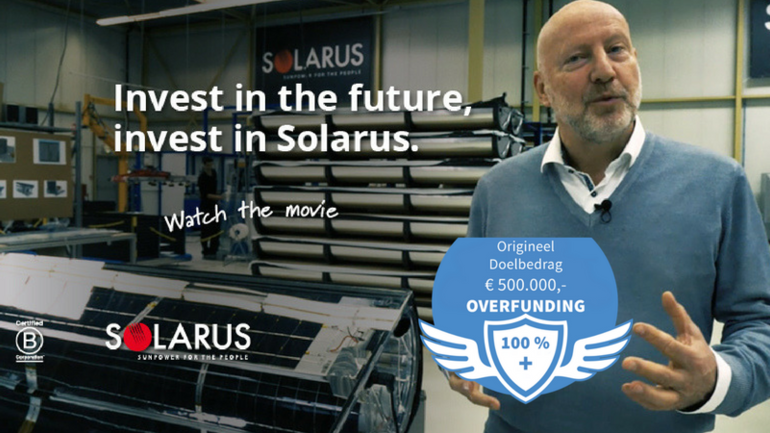 At the end of 2016 Solarus attracted € 800,000 with a successful crowd funding campaign. The management of Solarus also invested substantially last year. This is a unique opportunity to join our company and our mission. Our mission is Sunpower for the People, as a certified B-corporation, we also want to share our future success with the people. With this crowdfunding we are aiming at € 500.000 investment, representing 2,84% in shares in Solarus Sunpower Holding BV at € 14 per share. Although Solarus already exists 10 years, the market of PV-T is still a relative new market. Our growth strategy is based on growing commitments and positive feedback from our clients and business partner. It should be clear that an investment in Solarus is in the category “High risk, high reward”. Our management, our supervisory board and our employees are all fully committed to ensure Solarus will become a success. There is a funding risk because additional funding should be raised within this emission to realize the plans for growth. This means that in case the issuing entity does not succeed in raising additional capital in this emission, this can limit future growth and can even lead to bankruptcy of the issuing entity. Most startups fail and because of this as an investor in equity it is more likely to lose the invested capital than get a repayment or return on your investment. Therefore it is wise to invest no more than the amount for which a loss will not impact ones standard of living. We advice everyone not to invest with borrowed money. Any investment in equity that an investor makes on the platform must be regarded as very illiquid. There is no market for selling the shares of a private company. This means that it is unlikely that the company's shares will be sold until the company sells the shares on a public market or the entire company is taken over. However, even for a successful company, it is unlikely that an IPO or full sale will take place within a few years after an investor has invested in the company. Startups seldom pay dividends. This means that if an investor invests in the equity of a company on the platform, it will be unlikely that despite the success it will earn money back through dividend or other profit distributions. Any profit will have to be made through the sale of the cooperative memberships. Even for a successful company, it is unlikely that this will take place within a few years after an investor has invested in the company. Every investment in equity obtained through the platform can result in dilution. This means that if the company collects additional capital at a later stage, it will emit shares of the company to new investors. In this way, the percentage of shares per investor in the company decreases. These new shares could also contain a certain preferential dividend right, results from sales or other rights that are detrimental to the investor. An investment can also dilute by issuing stock options to employees, suppliers or other parties associated with the company. The issuing entity is managed by Leendert Pieter Willem Zevenbergen and is a single legal representative. In order to further grow our company, we expect that our team will increase by 7 to 9 new employees in 2018. At this moment we have vacancies outstanding for technical projectmanagers to manage our current and upcoming projects. To increase sales we expect to grow our team in South Africa and India with 2 to 3 professionals, to support them also the technical support team need to be extended (2). For research & development we'll offer two positions in 2018. To manage our production we work closely with subcontractors how offer flexibility that is needed at this moment of our growth curve. An international and dedicated team with enthusiastic and engaged professional employees in e.g. solar engineering, sales, project management, production and logistics. All of them fully committed to make Solarus successful and contribute to accelerate the energy transition. Total number of employees is 37. 30 years entrepreneurial experience, 20 High-Tech startups, has headed several multinationals. "For me it is important to work for a company that has a real meaning and purpose. Solarus is such a company, building a better world and being a force for good." 20+ years entrepreneurial experience. Founder of one of largest solar related companies. Successful strategy implementer in renewable energy businesses. "I started to work for Solarus as we have an opportunity to build one of the largest corporations in the world in delivering highly efficient and green energy solutions with a highly superior product." 20 years of investment experience with focus on finance, business development, private equity and clean energy - enabler of several businesses (through GreenEconomics) with hands-on financial approach with relevant network. "I want to strengthen young companies towards a solid and sustainable future. I believe that this product can change our energy consumption profiles and behavior." "Solarus thinks and acts different. With our unique geometrical designed hybrid solar PowerCollectors and decentralized production model, Solarus is a certified B-corp and Blue Economy company and I am very proud to work for this relevant organization for the world." Expansive 20+ year international corporate experience in finance, projects & operations. "Working for Solarus means working with a team of enthusiastic people in an international and dynamic environment. 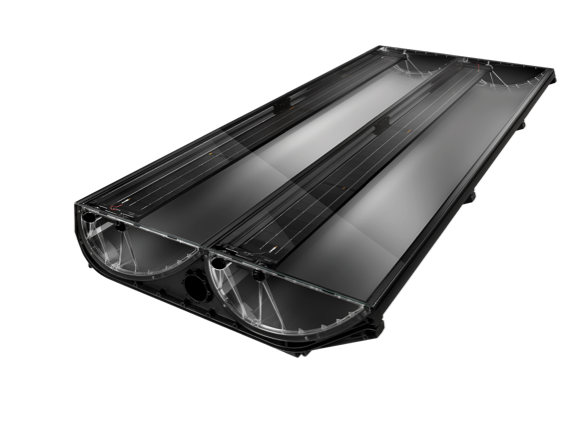 The Solarus PowerCollector TM offers the highest return of energy per m2 at a competitive cost. Thus making the world a better and greener place for all of us and future generations." 20+ years of experience in international product and technology development focused on sustainable solutions. "The sun is by far the most powerful force of energy we have. I love to work on the latest technologies to harvest this energy. That combined with our international staff and mix of cultures makes working at Solarus a great experience." 20+ years of experience in (inter)national Sales & Distribution, ranging from start-up to corporate organizations. "Solarus offers a unique combination of being good for our planet, and a huge business potential. Leveraging both is an incredibly attractive challenge for me." 25 years of experience in developing, engineering, and styling.From prototype to end product with specialization in tooling and manufacturability. "My ambition fits Solarus’ mission. Important for me is that we think what if and not in yes but, in other words: thinking in solutions. Moreover, it is a great company combining design & innovation to make the world a better place." 20 years of experience in (renewable) energy and sustainable business. "I believe in the potential of the innovative Powercollectors of Solarus. They will have an enormous impact on this energy transition and I want to be part of this journey of positive change!" PowerCollector units harvest heat and produce electricity within one integrated panel. The curved mirror reflects sunlight onto a receiver that is covered with solar cells and has heat extraction cooling channels inside. The result is a highly efficient power conversion ratio of 70% (50% through heat and 20% in electricity) compared to just 20% at peak power for standard PV panels. These collectors can be linked to the grid or be used as standalone installations for heating or cooling as well as electricity generation. This makes them suitable for both developing nations where grid infrastructure is not available, as well as for use as an adjunct to mains electricity supplies. The PowerCollector™ has the highest-ever yield measured*) for a solar panel. Its unique design allows the system to make the most of the sunshine — regardless of the season — without the necessity of expensive tracking technology. Its peak performance is 1.520 Wp: 1.250 Wp thermal and 270Wp electrical. The PowerCollector™ has some strong patents for innovations in the concept, the concentrator and the high-performance silicone gel that protects the PV-cells. The product is very robust and accurate as it combines Swedish and Dutch industrial design. The End-user Case Payback time of PowerCollectors can be optimized to 4 years, depending on location and energy prices, making them a highly attractive product to potential clients. Read more technical information in our technical brochure. Key in our business model are our local business partners in each geography. When we enter a country, we select one or more distributors (mostly larger installers and energy consultants) ready to develop the market with us. When there is enough market potential we work towards setting up one or more assembly factories in the specific geography. Working with local business partners (distribution and assembly) is the multiplying factor in our business model. Our personal networks and ambassadors help us in finding the right business partners and get the right introductions to them. So far, we did so in Cyprus, India, Kenya, Rwanda, South Africa, Switzerland and Turkey. The license fee model that we will roll out with our assembly partners will also secure a future stream of income. For the future we can also decide to license out some of our patents. For all recent installations, we introduce an online monitoring system to monitor the performance of each system and give directions to our customers and to plan pro-active remote maintenance. An integrated monitoring system, that combines both heat as well as electricity output is planned to go live in December 2017. 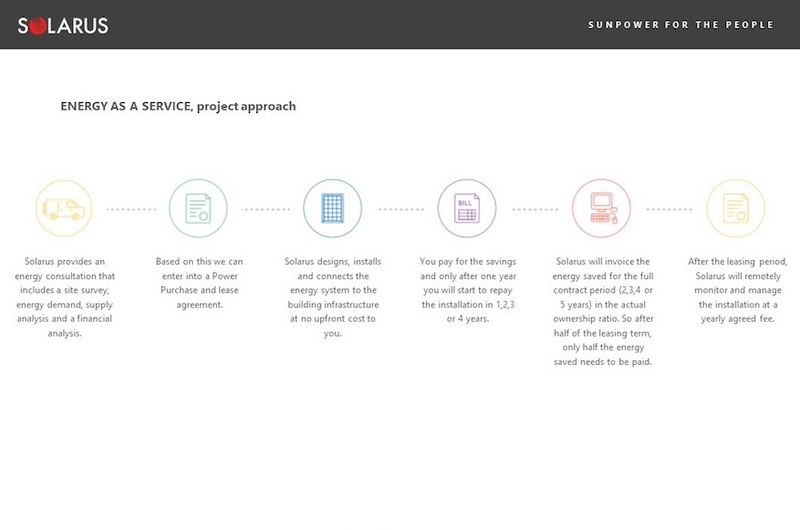 Based on our experience with our clients in South Africa, we are developing an Energy as a Service proposition. In this model, we invest in the energy installation for the client. The client pays for the energy delivered (which for him is cheaper than regular energy), and after the contract term, the installation becomes property of the client. During the contract period we can implement energy saving measures of which the financial benefits are shared between our client and Solarus. With our team we are working on further innovations that can be easily integrated in and add value to the PowerCollector such as an ‘in roof’ PowerCollector. The first neighborhood with this energy producing roof is being realized at this moment with our partner Ponzio in Switzerland as well as on a villa in Venlo. This in roof solution can be used for designs for new buildings or renovation of existing structures. Off grid cooling and desalination are also applications that have a big potential and could be fueled by the heat of our PowerCollector. These applications will be further detailed in the coming year with industry partners. We operate in a fast-growing global market for sustainable energy. For this moment we focus on a few geographies and a few vertical B2B sectors. We see a strong demand from geographies with a combination of a lot of sun and high energy prices like: South-Africa, India, Islands (Cyprus, Greek Islands, Maldives, Caribbean). We also keep track of the European market in which a growing momentum to get rid of fossil fuels makes our solution an attractive option. Since the PowerCollector produces both heat (hot water up to 70C) and electricity, the following sectors are ideal for Solarus. The solar PV market is growing at a rapid rate, driven by a mix of developed nations and emerging markets such as Latin America, India, China and large parts of Africa. On a domestic, business and medium industrial level, solar is a highly attractive proposition for end users seeking savings on their energy bills from grid suppliers, or for those not connected to a grid. Half of all the energy consumed in the world each year is used for heating, and 30% of that is to produce heat within the 40-70ºC range. There is also huge demand, especially in Africa and India where up to 70% of the population is not connected to the grid for energy, for cooling and food refrigerating purposes. Solar PV-T is an excellent solution for both of these uses. In 2012, the International Energy Agency (IEA) named PV-T technology as the most efficient way to obtain energy from the sun and said that it could solve the so-called roof top competition. The PowerCollector combines best of both worlds and delivers both electricity and heat at an affordable price. In 2017, Imperial College in London published a report that underlines the potential of solar thermal solutions for the European market and especially the promising outlook for combined thermal and electricity collectors. In the field of PVT solar collectors there is a limited number of mostly small and local companies active. We have analysed their technologies. No one uses the concentration technique we use, and the technological concepts differ quite a bit. Some of these market parties are still in POC (Proof of Concept) -phase and can't yet deliver. Names are: Fototherm, Solimpeks, Dualsun. We measured performance of competing systems and we came out best (in most cases by far) in year-round performance. For the establishment of new assembly lines in 2018 we are in negotiations with two different investors on two continents. These investors have an energy distribution or building construction background with strong local networks. The PowerCollector™ is the third-generation solar technology with a major competitive advantage over the first (heat collection) and second(PV) generation. Fifty percent of all energy consumed is for heating purposes. Up to now, most of that energy is non-renewable. According to the International Energy Agencythe PV-T technology is the most promising way to capture the energy of the sun. This is reflected by the highest yield (70%!) ever measured by TUV of the Solarus PVT technology. The yield of a normal PV panel equals 20%. With our technology we can provide you with 3x more energy from your roof. 3x more energy also means: 3x more profits. Therefore, an investment in the PowerCollector of Solarus is the best investment, both from environmental as well as from financial perspective. IIn 2015/2016 we sold 1.000 PowerCollectors™. In 2017 we expanded our sales team with Kees Onstein (CCO), Ron Coolen (director International Business Development) and Joost Brinkman (Director International Accounts). Their experience and network is a great asset to Solarus and already started to show with the development of new sales materials, new business partnership suite, the development of our Energy as a Service proposition and a growing sales funnel. In 2017 we sold 500 PowerCollectors™ and > 10.000 PowerCollectors™ are offered in proposals. Especially in South Africa we have developed a winning concept in which we save our clients’ money by saving energy and providing them with renewable energy. In this case we do not only sell collectors, but sell our energy as a service concept in which we also make profit on the energy that we save for the client. At this moment we perform direct sales in Western Europe (out of the HQ in Venlo) and through our sales office in South-Africa (Cape Town). In the future direct sales will only be done to large global customers. But even there we prefer to work with our local partners to service the customers. In several European countries (Netherlands, Cyprus, Switzerland) as well as in Turkey, India, Kenya, Rwanda and South-Africa we have established distribution partnerships. We are starting marketing campaigns for specific sectors (e.g. hospitality and food business). We have experienced good results with campaigning on social media and we will continue to do so. Short term: the aim is to have Solarus recognized as a very attractive alternative for sustainable energy in the three focus sectors (hospitality, (process)industry and domestic/real estate). We’ll do this with a mixture of online/ social media presence as well as by actively participating in industry events and conferences. The issuing entity is active since 30-12-1996. The following financial information is the most recent information available. The equity/debt ratio is 66/34. After the issuance of the shares (with the minimum funding goal of €800.000 this ratio is 70/30. Loan from Almi from Zweden with a total outstanding amount of €80.000 with an interest percentage of 10%. This loan has to be re-paid by 1-6-2018. Each month €10.000 is repaid. Now that the new collector model and the automated production line is in place, we are well positioned and ready for exponentially growing our revenues. This revenue comes from sales of PowerCollectors, Assembly lines and Energy as a Service-contracts. The projected turnover comes out of the Strategic Financial Model prepared in close cooperation with Roland Berger strategy consultants. An assumption is that Solarus will sign with 5 strategic partners in different countries resulting in sales of 3-7 assembly lines during the time period 2018-2021. Project sales realized by the partners will drive component requirements of the Power Collector for the assembly lines in each of the respective countries. Another assumption is that Solarus will be able to execute its Cost of Goods Roadmap (CGR). The CGR assumes significant material (15-25% cost reduction) and labor hours (50-75% reduction) savings in future improved versions of the product over the next 3 years. The cost price reduction is an important driver to become generate more sales and become more profitable. Since the spin off from Vattenfall in 2006, Solarus has attracted EUR 14 million investments mainly from some smaller public funds as well as from individual investors closely related to the company. In 2015, Solarus transferred from Sweden to the Netherlands and moved into the Venlo production facility. As part of the transfer Rabobank invested EUR 500.000 through its Kickstart fund and a local early stage investor put in another EUR 250.000. During 2015 and 2016 the current investors invested another EUR 1,8 million. In 2017 EUR 6,7 million from two professional investment funds and a crowdfunding campaign was raised. The total investment requirement to realize our growth plan in 2018 is 2.6 million. We are in negotiations with several large investors and expect to secure this investment in the first half of 2018. Since we obtain a lot of requests from existing shareholders and the wider public to invest in Solarus, we decided to launch this second crowdfunding campaign. This will be the last and unique opportunity for ‘the crowd’ to become shareholder in Solarus and benefit from our expected future success. You invest in a cooperative membership of Solarus Cooperatie U.A. For every successful issue of shares issued via Symbid Cooperatie UA to investors a new 'investment cooperative' is set up, one per issuing company. This only happens if the financing requirement has been met successfully. The various investment cooperatives are therefore separate from each other and therefore only run the specific risks associated with the issues from companies in which they have participated. Investors buy indirectly shares in the company through this investment cooperative and receive cooperative membership certificates in proportion to their investments. The function of the investment cooperative is not only financial, for the entrepreneur the cooperative is also an opportunity to reach its investors. He or she can ask his investors for advice through the cooperative and the cooperative also acts in case the shareholder's legal consent is required for decisions within the company (private limited company) of the entrepreneur, for example when the share capital is extended. The memberships (and therefore investments) are to a limited extent transferable, namely after permission has been obtained from the board of the investment cooperative concerned. The Investors Cooperative - Solarus Cooperatie UA, in which an investor in this issue will receive a B membership per € 20 investment, will then use the entire proceeds of this issue to acquire ordinary shares in Solarus Sunpower Holding B.V. available at a price per share of € 14. The minimum raise of this issue of € 500,000 represents a share percentage in Solarus Sunpower Holding BV of 2.84%. The return is paid in the form of a dividend and / or an increase in value on the sale of cooperative memberships. The investor receives the dividend if the financial situation of the issuer allows this. During the general meeting of shareholders within the issuing institution, the profit realized must then determine whether and how much of the profit will be distributed as dividend. More information about the dividend policy can be found in the already active shareholders agreement between Solarus Cooperatie UA and the issuing institution. This shareholders' agreement can be viewed in the attachments. The dividend for investors will therefore first flow to the Investors Cooperative - Solarus Cooperatie UA after payment by the issuing institution. Depending on the type and number of memberships that an investor (as a member of the cooperative) has, a dividend can be distributed to the member. There will be 2 types of memberships in the Solarus Cooperative UA after this issue. The different memberships within the Solarus Cooperatie UA will have other financial rights. 1 A membership in the Investors Cooperative - Solarus Cooperatie UA gives indirect financial right to 1.66 shares in Solarus Sunpower Holding BV. These A-memberships have already been acquired by investors from a previous round. 1 B-membership in the Investors Cooperative - Solarus Cooperatie UA gives indirect financial right to 1.43 share in Solarus Sunpower Holding BV. These B-memberships are obtained within this issue. The Investors Cooperative - Solarus Cooperatie UA has already been established during an earlier issue via the crowdfunding platform of Symbid Cooperatie UA. During that emission, the total revenue was € 799,740 and was completed on 31-12-2016. During this issue, the Investors Cooperative purchased a total of 66,645 ordinary shares with a price per share of € 12. The entrants to this previous issue have obtained A-memberships whereby the ratio of membership: share is equal to 1: 1.66. In other words, 1 A membership in the Investors Cooperative - Solarus Cooperatie UA gives indirect financial rights to 1.66 shares in Solarus Sunpower Holding BV. As soon as a dividend is received from the Investors Cooperative - Solarus Cooperatie UA, the articles of association of the cooperative will determine the profit allocation. The following parts of the articles of association of Solarus Cooperatie UA relate to the profit allocation. The complete statutes can be found in the appendices. The profit, which has been achieved in the last financial year, can be reserved in whole or in part by the board with the approval of the supervisory board; to the extent that the profit is not reserved, it is at the disposal of the general meeting. If the general meeting decides on profit distribution, the profit shall be divided among the members in proportion to the nominal amount of each of the units or their fractions. Distribution of profit will only take place after the adoption of the annual accounts showing that it is lawful. The management board may, with the approval of the supervisory board, decide to make interim distributions from the profit for the current financial year. Unless the general meeting sets a different term, distributions to members at the expense of the profit made in the last financial year will be made available within thirty (30) days after the decision to pay has been made available. A deficit may only be offset against reserves prescribed by law if and insofar as the law permits. Any loss will be deducted from the reserves and if the deficit exceeds the reserves, a negative result reserve will be formed. The provisions of the preceding paragraphs apply mutatis mutandis to a resolution of the general meeting to distribute to members of a reserve or part thereof. See the "risk section" in the summary on top of this page for a detailed overview of all the risks. Symbid Cooperation UA is a tied agent of the Limited company (BV), Ilfa Tools & Services B.V. as defined in the The Financial Supervision Act (Wet op het financieel toezicht (Wft). Ilfa is an investment firm as defined in the Wft and has a license for this as defined in article 2:96 Wft. Because of this Ilfa is under AFM supervision. Investors Cooperative - within this issue: Solarus Cooperative UA This entity is established when a proposition has achieved its funding target. An Investor Cooperative will be set up per successful issue, which is fully independent of Symbid Coöperatie UA. In the investment cooperative the bundling of network, knowledge and capital of the investors takes place. This is then transferred to the entity of the entrepreneur, the entrepreneur gives the share percentage offered on the platform to the Investors Cooperative. The investors cooperative participates in only one entity (the legal entity of the entrepreneur). Ultimately, each investor will obtain the memberships requested on the platform in the Investors Cooperative. These memberships represent control in proportion to the number of memberships that an investor owns. The memberships are transferable after permission has been obtained from the board of the Investors Cooperative. Valuation of the membership takes place through internal supply and demand. Legal Entity Entrepreneur - within this issue: Solarus Sunpower Holding B.V.The Investor Cooperative UA will act as a shareholder in the legal entity of the entrepreneur. The Investors Cooperative provides network, knowledge and capital for the entity of the entrepreneur. An online collaboration environment will already be made available during the investment process in which the entrepreneur can communicate with his investors and the members of the investment cooperative can meet.